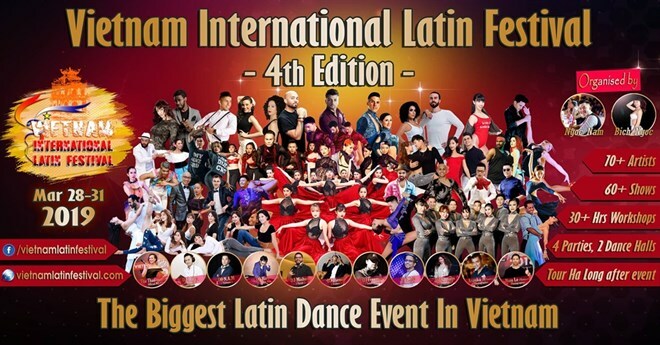 Hanoi (VNA) - An international festival dedicated to Latin dances will begin on March 28 and last until the end of this month. Taking place at the VCCI Tower, 9 Dao Duy Anh Street, Dong Da district, the 4th Vietnam International Latin Festival will gather more than 70 dancers from 30 countries and territories including France, Italy, Spain, Argentina, Mexico, Russia, Singapore, Japan, the Republic of Korea, Germany, India, and Colombia. The four-day event, the biggest of its kind in the country, will include more than 60 performances by the world’s top dancers. Alongside, festival-goers can attend workshops, bootcamps and master classes during the festival. Every night, a line-up of DJs from France, Egypt, the Republic of Korea, Japan, Malaysia, Hong Kong and Vietnam will turn the dance halls into amazing parties.